Daniel is developing a diverse commercial chancery practice that spans all of Chambers’ practice areas. He is regularly instructed to appear as sole counsel in the High Court and County Court, and is often also instructed as part of a larger counsel team in more complex and high-value matters. Daniel’s practice also involves a considerable amount of advisory work. He has experience in both domestic and international work. A secondment to Ogier’s offices in Jersey, working on international civil fraud and trusts matters. Clerking regularly for the Determinations Panel of the Pensions Regulator. Drafting a substantial application for clearance in a pensions regulatory matter. Acted for the Defendants in a multi-million pound breach of directors’ duty claim in Gibraltar (led by Terence Mowschenson QC and Sebastian Allen). Acted for the Defendant in a partnership dispute where the defence to an account of profits was illegality (led by James Bailey). Acted for the Defendant in a substantial claim which alleged fraudulent misrepresentation and breach of warranty (led by Bobby Friedman). Successfully acted for the Defendant landlord in a housing disrepair claim, involving a 1-day trial and extensive cross-examination. Advising and acting for the Respondent in an adverse possession claim based on a boundary dispute. Advising beneficiaries on a claim brought against a deceased’s estate under the Inheritance (Provision for Family and Dependants) Act 1975. 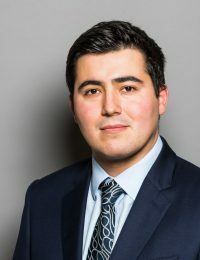 Daniel joined Chambers in 2018 upon the successful completion of his third six pupillage. His pupil supervisors were Jonathan Hilliard QC, Sebastian Allen and Martin Hutchings QC. Daniel previously undertook a 12-month pupillage at another leading commercial chancery set. Daniel studied English Literature at Durham University and graduated in 2014 with a first class degree. He was awarded the Brooks Johnson prize for the best result in the Shakespeare finals paper. Daniel went on to obtain a distinction on the GDL at City University, where he was subsequently graded outstanding on the BPTC. During his time studying law, he won numerous academic prizes, including awards for the best results in European law and Commercial law. He is also the recipient of a major scholarship from Middle Temple.